As Military Moms we face unique challenges every day and author Elaine Lowry Brye is no different. 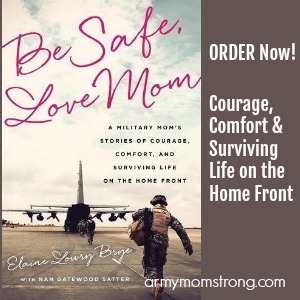 In her new book, Be Safe, Love Mom, she makes her Military Mom journey come to life through stories that made me feel as if they were my own. CLICK HERE to order Be Safe, Love Mom. Through fifteen years of goodbyes and a flurry of emotions, Elaine chronicles her own experiences with four children, all officers, and imparts her wisdom on how to navigate through it all. 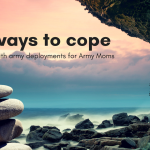 Her story, as well as those she shares of other Military parents, was like seeing a reflection of my own experiences through the years as an Army Mom. 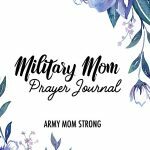 Her strength and guidance is a must for any Military Mom, regardless of where you may be on your Military Mom journey. 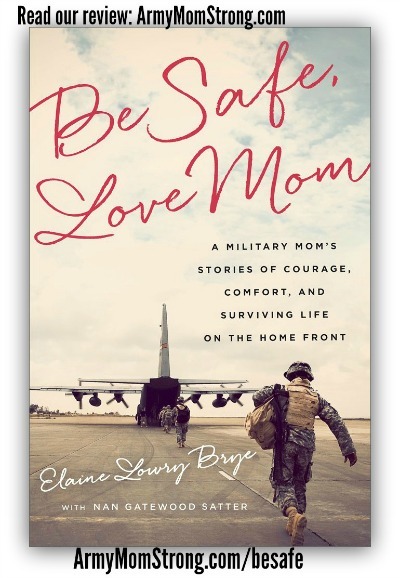 Elaine’s transition to Military Mom is one of the many reasons I loved reading “Be Safe, Love Mom“. She does so graciously with strength from within that rings so clear and true for me. Our inner most feelings as Military Moms are practically inexplicable to anyone outside of our one-of-a-kind sisterhood and throughout this book, I felt the things she feels. She understands. Transitioning from parent of civilian to parent of service members is not easy and Elaine does it with grace and honor. We all have a lot to learn from her courage and insights. Be Safe, Love Mom is filled with a real cast of characters that could be you, me or any of our Military sons and daughters. She really brings home the message that we are all in this together. As I read this book, I laughed and cried with her as her stories unfolded – from family life on the farm to a year spent working in Afghanistan. Be Safe, Love Mom is a “must-read” for anyone who wants an inside look at the life of a Military Mom and especially for those who are navigating a similar journey. My daughter left for boot camp yesterday. 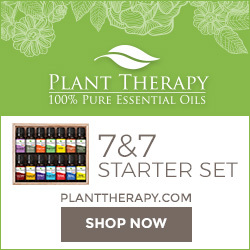 Im looking for any advice on what to expect and how to cope. My son left for boot camp on July 7th. I, too, would appreciate any advice on what to expect as a new Army Mom. As a military mom I can tell you it is tough when they first go to camp. It hurts. It is a nagging hurt in the pit of your stomach that never seems to be quenched by anything.. So many thoughts go through your mind and one of them will be I didn’t ask for this yet I am the one hurting. To make it even harder for me, my Son left a month before Remembrance Day. My advice is don’t drive yourself crazy trying to cope. You cant change what has happened. They are now part of the military like it or most likely not. Instead remember this….not every mother has the guts the strength the internal fortitude to raise a child strong let alone army strong. Your child is an amazing person to join and they never would have had the guts to do it if you hadnt been an amazing Mom. I dont look for a hero…I raised mine and damn proud of it. I am a 3 Blue Star Mom. I have 2 sons deployed in the Middle East. I live in an area that doesn’t have many military families. It would be nice to have other moms with kids in the service to talk with. It’s been a very hard journey. Your life is different than everyone else around you. No one in my family is military so it was a shocker to have all 3 kids in the service. 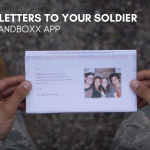 I did find a group that makes packages for deployed soldiers which helps to cope. I just started reading Be Safe, Love Mom and it has made me feel a whole lot better. She lets you feel that you’re not alone. Prayers always help especially when you don’t know where they are and haven’t heard from them in awhile. My son is in the first steps of joining OCS, and I am dying inside. The comment from Victoria helped me so much. I am tying to take one day at a time and not worry about issues till they arrive…If I could only have him 5 again. My nephew has been in the Army for 4 years now, Last time he came home was one year and one half. Since then he has not called his mother, (my sister). She is devastated and can not comprehend the reason why he is not calling, responding emails, or phone messages to no one in the family. My sister is fallen into a big depression and I do not know what to do, she does not want to go for psychological help or therapy. If there is any support groups for mothers with problems like this, also I am afraid that my nephew could be depress as well. Please advise, I need some guidance on how to help my sister. If there is a support group in Los Angeles, California please let me know, or if someone can even contact her, over the phone. maybe she will open up. To Pauling Perry: I am a Marine Mom and find your story heartbreaking. I could not imagine not hearing anything from my son for this period of time and further, not knowing the circumstances. 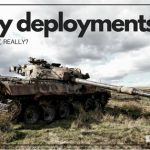 I don’t know how the Army is, but the Marines have readiness officers that provide an open Avenue for contact if family’s have concerns, especially during deployments. Even if they can’t give you any specific info they can relay a concern to your service members CO and if it is possible they will “insist” that the service member contact their familymember. The caveat is that the service member must give permission for the FRO to keep communication with the family members. Also, cosnider joining a chapter of Blue Star Mom’s in your state. They are a WONDERFUL support group. I will keep you in my prayers that this info helps your family in some way.